Uncle Sam & Bharat Mata has a common enemy-Terrorism. Both have witnessed some of the worst terrorist attacks in human history on their soils which have shocked the world. Particularly, September 9, 2001 attacks in the USA & November 26, 2008 attacks in India have widely altered the attitude towards security & intelligence gathering of both the countries. Consequently, recent years have seen unprecedented co-operation between two nations which appeared to be hostile during cold war days. Both are investing heavily on counter terrorism strategies & also assisting each other in terror related investigations. 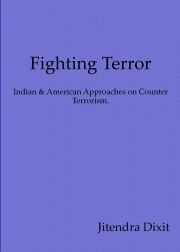 This book widely analyses the US counter terrorism strategies and examines their viability in Indian scenario. Apart from simple comparison of the counter terrorism initiatives of both the countries, the book also focuses on the grey areas & examines cases where sometimes in their over zeal, the security agencies have crossed the line. The book is written in a casual & jargon free language & is intended for general non-fiction readers. It may be especially helpful for those who have newly developed interest in reading on counter terrorism, security & intelligence. Jitendra Dixit is a television journalist having core competence in international organized crime & terrorism. He specializes in working on conflict ridden areas. As a part of his profession he has covered most of the major terrorist attacks in Mumbai, followed their investigations & trials & has also written a book based on his experiences during 26 November 2008 Mumbai attacks. He reported on the aftermath of Tsunamis from Japan in March 2011 & Tamil Nadu, India in 2004. In 2005 he travelled to Norway to trace the family of a film actress Monica Bedi who was the wife of gangster Abu Salem. He has also widely reported on organized underworld gangs run in the city of Mumbai by Dawood Ibrahim, Chota Rajan & others. He produced & anchored two crime shows on Star News, “Red Alert” & “Shootout” for Star News. He was invited by the Department of States (of the US Govt) to represent India in Combat International Crime Conference organized in Washington DC & New York in April 2011 under auspices of International Visitors Leadership Program (IVLP).